No? Not familiar with this little DIY fairy tale? Well then, let me fill you in. The selection of a grout color for a large bathroom is easy...said no one...ever. That's why, once upon a time, three little bears named Wendy, Alex, and Lulu went out in search of the perfect grout color for a bathroom renovation that's taken longer than any of them would like to admit to the world. 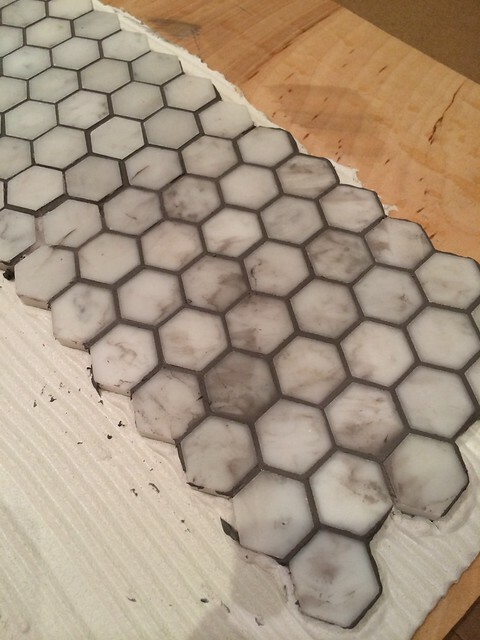 Since these three bears were using one inch marble hex (actually, 1.25" marble hex) with 1/16" grout lines on their master bathroom floor, the color of the grout would ultimately play a major role in the overall look of the room, primarily because there's going to be a ton of it visible. 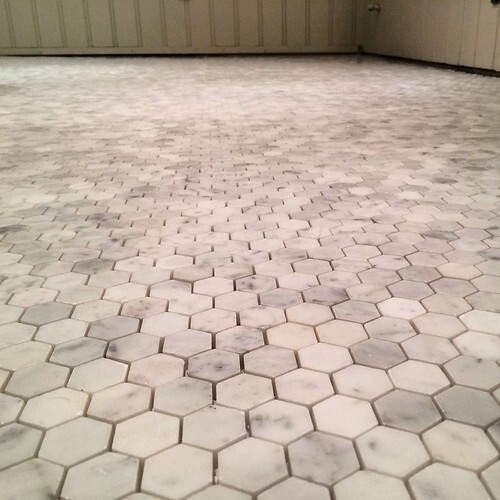 While the bears may not have been tiling pros, they knew that with a white (or gray) stone tile, like marble, the rhyme to remember is "the whiter you can go with the grout, the less you'll see the problems in the layout." However, this is in sharp contrast to the other rhyme of "historically accurate grout is gray." Okay, that's less of a rhyme and more of a fact. I guess preservationists aren't into rhyming. But the three bears knew, even without a rhyme, that a darker grout color is the only "correct" historical color. I think this goes all of the way back to the days of dinosaur tile setters. These two are obviously discussing a tile quote. 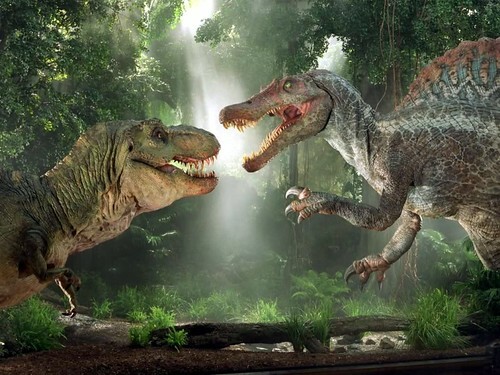 It may have been millions of years ago, but it's rather obvious that T-Rexes all had to hire out their tile jobs because their arms were too short to tile or grout. But back then, their triceratops and brontosaurus tile setters would use gray to dark gray grout exclusively, likely due to the fact that it all came from volcanic rock. Also, I don't think any of the big box stores carried the color varieties back then. After grouting was complete, the dinosaur tile setters would show their customer the finished job and the T-Rex would usually eat the tile setter. It was a bad job to have. But this isn't a story about dinosaurs' DIY shortcomings due to under evolved arms, this is a story about bears and grout, so let's get back to the point. 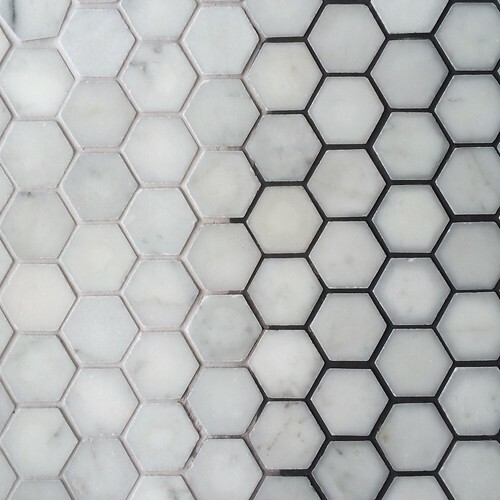 Throughout history, from the dinosaurs to the Romans, to the Victorians, gray and dark gray grout was the only way to go (and the only way available). It's only in recent times with color additives and polymer blends that the three bears even have an option to use something other than gray. The thing is, the three bears, and especially mama bear, had been planning on grouting their tile with a darker color. And as you may be able to guess, papa bear was all for an historically accurate approach with dark grout, as he likes historically accurate. They'd talked about it, day dreamed about it, and planned for it while they did their bear things around town. So when it came time to select the grout color they wanted, the bears jumped into the bear family truckster and headed out to the Tile Shop to do a little grout color selecting. What happened when they arrived? Well, apparently the two bears (baby bear was left home) chickened out. 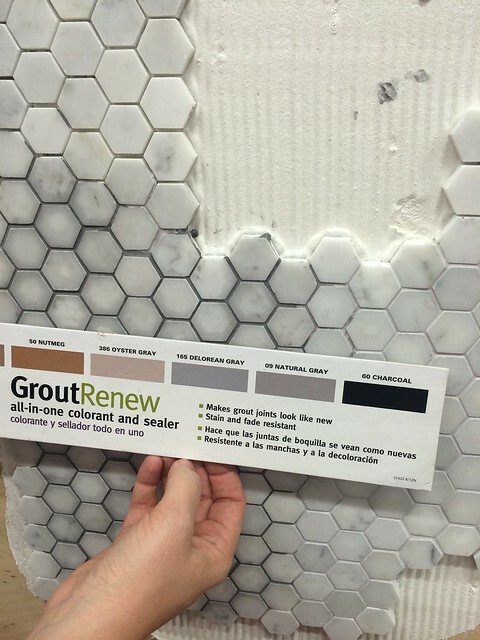 Their initial intent to select a dark grout somehow morphed into the selection of a grout color that was second lightest on the grout color chart. The guy who was helping the bears was pushing the lightest color, so they felt like they were being bear rebels simply because they went with the second lightest shade. While they thought they were being bear badasses, they were actually being bear wimps. 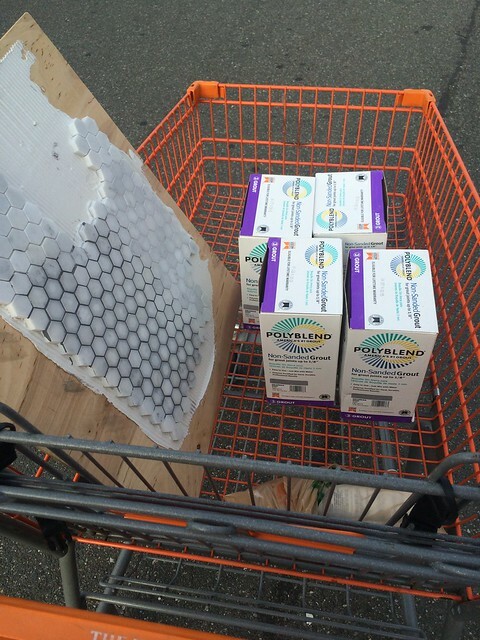 With their not nearly as dark of grout in tow, they headed home ready to take on the whole bathroom. Luckily for these bears, this wasn't their first grout rodeo, and they realized just how much grouting they had ahead of them. 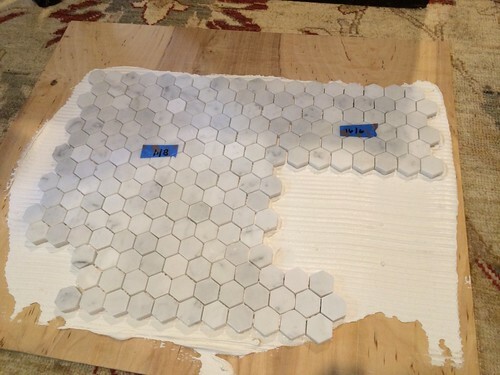 They also realized that marble hex is not nearly as forgiving as 8" by 12" tiles when it comes to poor grout selection. 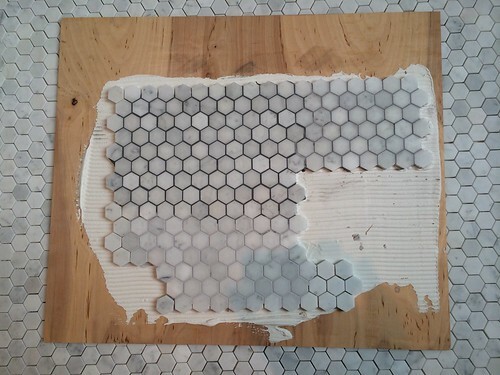 If you need to remove a bad grout from hex you might as well just rip up the floor and start over. There's no "chip it out and re-grout" (another great tile setting rhyme there) when it comes to a small mosaic tile mat. But that's why these three bears had a plan. Rather than jumping into the grouting pool before even checking the depth, the bears decided to make a sample board so they could test out the color. I encourage everyone who might ever read this tale to do exactly the same if you ever find yourself grouting even a small room. It's too easy not to do it. Several days before the bears grout adventure began, papa bear grabbed a piece of scrap plywood from his disgusting, cumbersome, horrible, awful, and just plain terrible basement hoarder lair and mixed up a little bit of thinset. (Honestly, papa bear's basement is so bad that he can barely even move around down there, but he'd rather hibernate than deal with it.) Just like laying one of the sheets of tile on the bathroom floor, papa bear applied a few scrap sheets of tile to the plywood to act as an example of their bathroom's floor. He made sure to vary the sheets and their alignment slightly to simulate all of the variability in the room. Some spacing was too small, some spacing too large, some tiles were left high, others pushed low, and he even made sure there were a few tiles that represented the crooked population of off kilter hex. But some of the tiles...some of them were juuuuusssstttt right! Even Mel approved of the sample board, though he was in the midst of a full blown temper tantrum because he didn't make the cast as one of the three bears. We told him we thought his being featured on the cover of the real estate section in last Saturday's Washington Post should make up for it, and we even promised him the starring role of Goldilocks. Mel, well, he was having none of it. This sample board proved to be invaluable. On a Friday night, with absolutely perfect weather, the bears popped the cork on a little sparkling wine (bears like bubbles more than beets, remember that), enjoyed some cheese, nuts, and honey, and did a little grouting on the sample board. 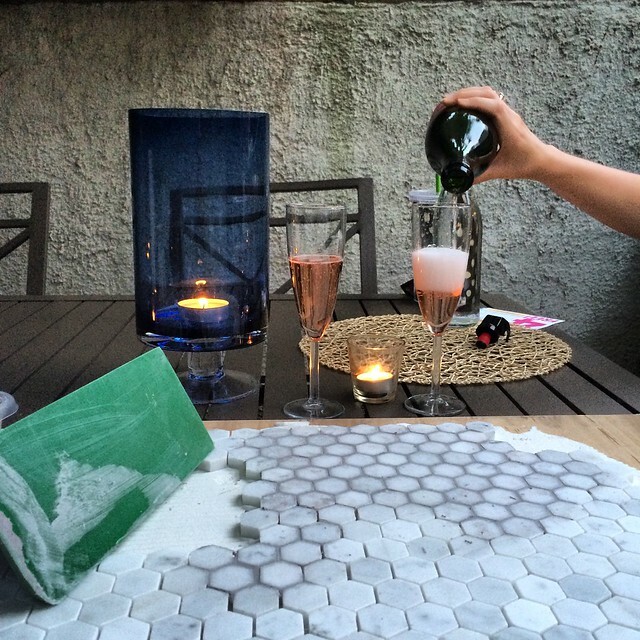 Excited to see the grout color come to life on the tile, these bears paid no attention to the fact they were using their Friday night and a bottle of sparkling wine to grout their sample tile rather than having a fun bear's night out. They allowed the grout to dry, the whole time thinking they'd be waking up first thing on Saturday and grouting the whole bathroom. After all, it looked like a slightly lighter version of the color the bears wanted when it was wet. But as the grout began to cure the frowny faces on the bears began to grow (except for baby bear, she was sort of oblivious). For what seemed like an adequate gray began to change to an almost white color over the stone. By the time the bears awoke on Saturday morning they were cranky and dejected. While they had hoped for a color that was juuuuusssttt right, they were left with a color that felt completely wrong. Undeterred by their minor setback, the bears marched right into The Tile Shop once again with the hope they'd be able to muster the courage to get their darker grout. 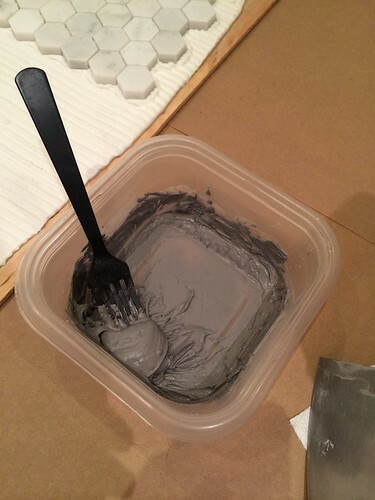 But that's the thing about the Tile Shop grout colors, there isn't a wide array of true gray grout, so the next darkest was called charcoal and was very dark. This time, without hesitation, the bears asked for 30 pounds of the Charcoal grout and exchanged their purchase of Dove Gray. Though the exchange process took and exceedingly long time, due to checkout system errors and the need to try multiple credit cards, perhaps 20 minutes or more to check out, which resulted in a near meltdown from Mamma Bear that required a bit of a bear walkabout through the store to keep a level head, the new grout was ultimately acquired and the bears were on their way. As they applied the new charcoal grout to the board the bears both had the same though, "ruh-roh, that grout is actually quite dark. Is this right? Is this the color we want? Or is this just too dark?" The bears, being modern bears with smartphones and social media know-how, took to Instagram with a #nofilter post to solicit the advice of their Internet friends. And while the bears really hoped everyone would say "oh, bears, that dark is just splendid, you simply must grout your new floor using that dark gray, it would be a true shame to go light." (That's how the bear's Instagram friends usually talk.) The reality of the response was quite a bit different. Overwhelmingly the Internets thought the bears' light color grout was the way to go. Even people the bears thought for sure would prefer the dark wanted the light! And though the board had yet to cure, the bears knew in the their little bear hearts that this color was simply too dark. Having now wasted half of the day they had hoped would have been spent grouting, the bears had established a grout color that was too light, and a grout color that was too dark. 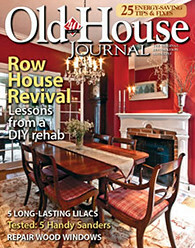 But they were still in search of a grout color that would be just right. Frustrated but determined, the bears had to move on from The Tile Shop due to the limited colors and set out to search the orange box for the preferred color grout. If you're keeping score, this now meant the bears would be spending Saturday evening on their grout hunt. And while this may make for a "nice little Saturday" for some, it wasn't in the original plans for these bears. The bears lumbered into the tile and grout aisle and located the many boxes of grout. The only problem, almost every single box was of the sanded variety. 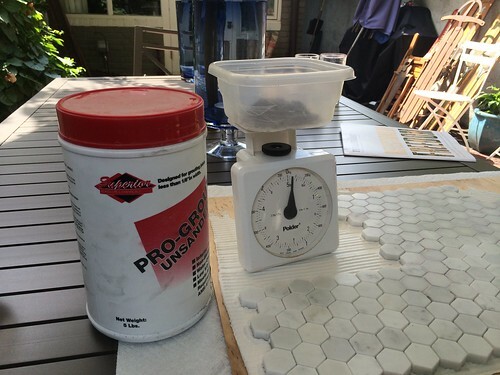 Since the bears are grouting tile that has a maximum of 1/16" grout lines, they needed un-sanded grout. While they searched the bears found a grout color chart and held it up to their sample board they'd brought with them to the store, like a couple of grouting bear crazies. In a way, the bears just wanted to jump into a time machine that would take them back to the beginning of this whole process so they could just choose the right grout from the start. And, in a way, they'd just found one...of sorts. "Delorean Gray" was the color, a happy medium between the too dark and too light and named for one of the most famous time machines ever created (and not named for the failed 1980's overpriced stainless steel sports car, obviously). But the question, would they have it in unsanded? Returning home, the bears were both tired and excited by the prospects of actually moving ahead with their grouting work. Bears love grouting, and to this point, working only on sample boards was a lame second to the real thing. But the bears needed to measure out just a little more sample grout from the newly purchased boxes to run one more color test on their sample board. They'd already seen too dark, they'd already experienced too light, perhaps, just perhaps, this grout color would be juuuuuiissssstttt right! It may have started our quite dark, but the next morning, after an appropriate amount of dry time, the bears took a look at their sample board and found the color had dried to that soft medium gray they were searching for. Their "time machine" had worked, and the Delorean Gray (upper right) was the answer to their color questions. It was a process to say the least, and one that required perseverance and patience to select the appropriate color. The bears had a lot of work ahead of them before they can call the grouting complete, but one of the hardest parts of the process was now behind them. Most importantly, the bears learned that a sample board is an invaluable piece of a proper grout selection, that return policies are a great thing, and they're fortunate that the various home improvement stores are all withing a relatively short drive in the bear family truckster. And you're wondering where Goldilocks (but the male version) was throughout this whole ordeal, you need look no further than the nearest cushion. Apparently they are all pretty much just right. 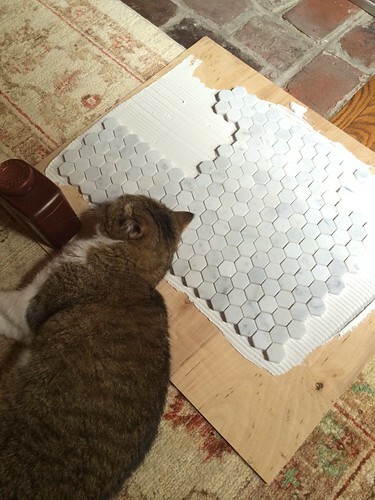 do you mind sharing where you got your floor tile from? we are looking to do 2" hex tile for our bathroom floor. also, how does the delorean grey compare to the warm grey you used for your kitchen backsplash? Sure. We bought online (found through Amazon) from Oracle Stone & Tile in California. Wow what an awful read, please dont write anything from "the bears" perspective ever again. Thanks for the info though. We just redid our bathroom and used the delorean gray grout and caulk with out white subway tile on the walls and on the floor with our dark gray tile. It looks great! Great to know you like the look. Was the grout color consistent for you throughout the room? I understand how frustrating it can be to find the color that is "just right", but it looks like your time spent was worth it - that last color is my favorite! I'm excited to see the results in the room. That sounds like a huge pain, but it looks great! The darker grout looks like it's got much more character. 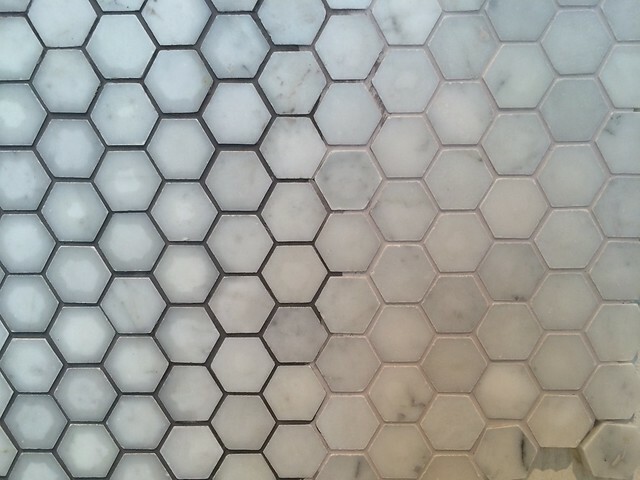 It's easier to see the honeycomb tile design with this than with the light grout. Also, I didn't know much about tilework, so thanks for the tip that the darker grout is more historically accurate (re: dinosaurs). PS - Out of curiosity, did your grouting make the tile a smidge darker? Or is it just an illusion? Yes, the grouting temporarily made the tile darker, but that's only because we didn't really seal the sample board, so the stone soaked up some water. Once it dried it was all back to normal. I think all the wasted time will be worth it. The dark was way too dark, and the light looked bad, but the Delorean Grey looks pretty great. It's dark enough to clearly define the pattern, but not so dark that it doesn't match. This is exactly our hope. I loved the look of the very dark on the board at first, but looking at it in the context of a large room, it would have just been too much. First off, love the way this was written with bears in mind. That said, I agree with you all that the light, or white grout was TOO light, as the hex tile then looked a bit undistinguished. That is, as it was, it didn't really do anything since at that point, why even do the hex when it doesn't show? 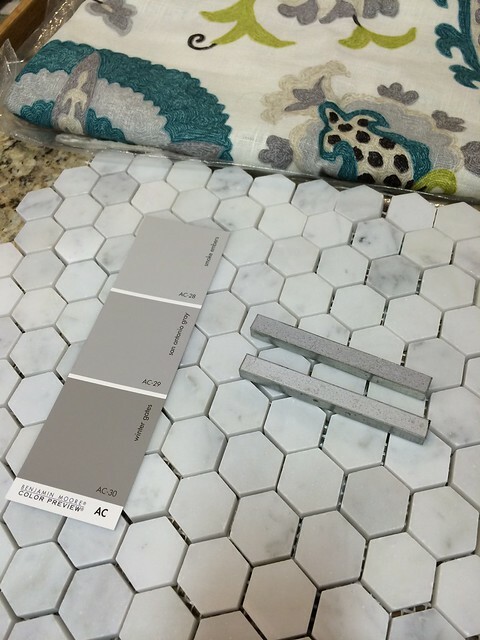 The darker gray you used was too dark, I agree, it stood out too much against the medium to light gray tile you had and it would have accentuated any imperfections with the overly high contrasting grout. The Delorean Gray, I agree was just right as it provided enough contrast to show, but not so much that it would have stood out in a ridiculous way. In the end, all that work I think resulted in finding the right grout that you two will be happy with, and that's what's important in the end. I think it'll look great once down. I also think we would have always questioned our choice had we not been thorough and taken the time to go through our options. I loved this story and the tip about the sample board--I could have used that last fall. My husband and I painted over all of the grout lines in our backsplash with grout refresh because we realized the grout we'd just finished applying was way too light. By the way for future reference, we bought our grout and tile from Morris Tile just over the border of DC in PG county, and they had lots of grout colors to choose from--much more than we found at the big box store. Ugh, what a paint to go over what you just grouted. You have my sympathies. We'll definitely keep that tile store in mind on future projects. I'm glad you're not going white. 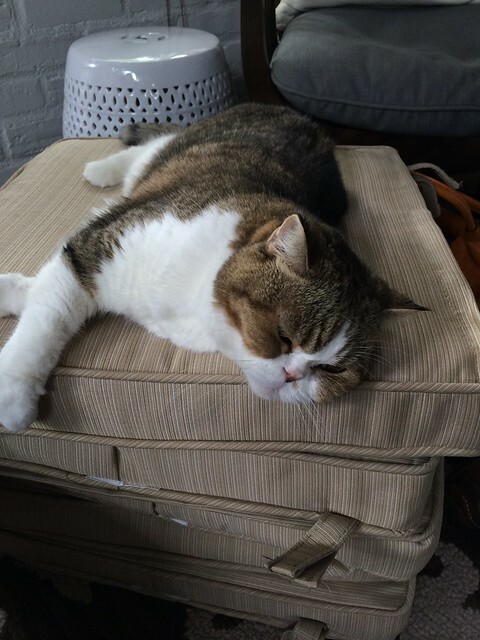 It's a misery to keep clean. The sample board is so smart - I'll have to remember that for my next tiling adventure. What a wonderfully funny and informative post. I'm reading this at work (and I shouldn't be) and actually laughed out loud. 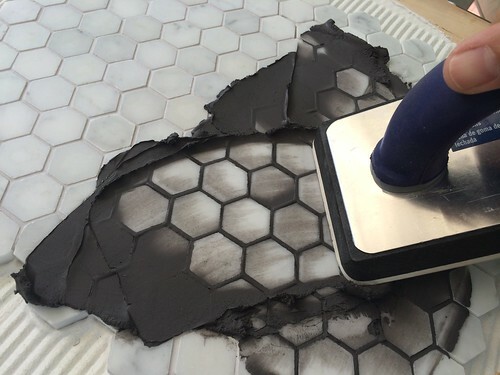 The tile board is an excellent idea especially for someone who is in way too much of a hurry and would end up living unhappily ever after with the wrong color grout. Sample boards save lives! Or, at least, sanity. We did one for our exterior paint color scheme and I'm convinced it's the only reason our contractor understood what I was talking about! I could even see doing a much larger board for an exterior project, even a partial window/field/trim mockup of a few feet. Thank you, thank you, thank you! We are in the process of tiling our bathroom floor at quite the opposite end of the tile continuum to yours; 12x24" charcoal slate. We have the exact same grout options, and I almost talked myself into going 'Back to the Future' but since I want it to look somewhat seamless, I pulled up my britches and bought Charcoal (seems obvious with the charcoal tile, but you saw how dark it was when you applied it). Seeing your dried samples has confirmed my suspicions, and prior experiences that grout always dries lighter than you think. Great write up style, kept me giggling. Thanks, Lesley. Good luck with your tiling project! 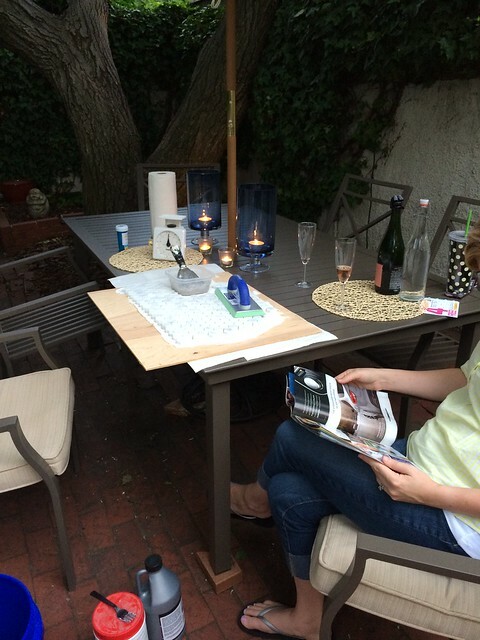 The practical information on grout selection was great, but most of all I loved your story. As I was reading along, I was feeling Mel's pain for being excluded, and was going to propose him as Goldilocks but you guys think of everything. Oh and it's especially good to know about dinosaur tile setters! We're devotees of dark grout but for sure when you mud with it there's an "oh sh*t" shock factor. And the darker the grout, the more care and cleanup needed. I like your choice, though perhaps I have warmer memories of the DeLorean auto than you do. I really liked how much detail you went in to with this article, I also think the use of pictures served to emphasize what you were saying, even if they were cute or silly. Thank you soo much for posting this. 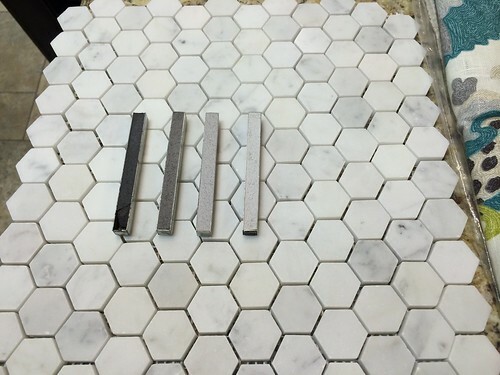 I am doing my bathroom this week and I just used this post to pic the grout (I'm too lazy for the board). Crossing my fingers! Thank you so much for this cute bear article....we have a victorian under renovation and lots of white and marble tile and have been struggling with which grout to pick!!! This helped so much. We will have boards made for sure!!! Hey loved your article. Don't listen to that frumpy Bill guy. I have the same Mosaic in my bathroom and went white 3 years ago. I've been thinking it's been Bland ever since. We're listing the house and our realtor recommended the grout doctor. They recolored it gray and now it looks fabulous. Similar gray to yours. 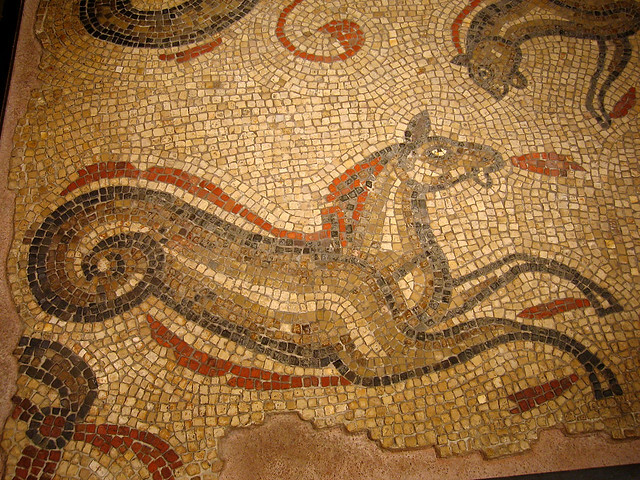 I'm trying to make the same decision on our new house with Moroccan mosaics and giant 24"Subway. Definitely want contrasting grout but maybe not too dark. Your post was helpful and brightened my day with a laugh. Thank you bears. Before I saw your log we had chosen the Delorean Gray for our Arabesque Lantern-Italian Bianco Carrara backsplash tiles.The counters are Calacatta white Quartz. Now my contractor tells me it is too dark!. So I am thinking go to the Cape Gray but still like the Delorean Gray based on experience.